The women’s missionary societies that had started in the 1800s continued to play vital roles in Lutheran church life well into the twentieth century. Mission work also provided many women with firsthand opportunities to minster and lead. Among these female church workers were deaconesses and nurses like Helen Frost, who provided spiritual and physical care in Teller, Alaska for 35 years. Accompaniment models of ministry like those practiced by Frost fostered positive and lasting cross-cultural encounters. Essay: “Helen C. Frost’s Missionary Images of the Inuquiq (Eskimos)” by Julieanna Frost, LQ 23 (2009), 296-313. Image: Elizabeth Facktuo and Helen Frost, excerpted from “Helen C. Frost’s Missionary Images of the Inuquiq (Eskimos)” by Julieanna Frost, LQ 23, 302. An advocate for peace during the First World War, Swedish Archbishop Nathan Söderblum initiated the World Conference of Life and Work in 1925. In these years, he worked closely with the English ecumenical leader George Bell. He was awarded the Nobel Peace Prize in 1930 for his work for peace and church unity. Other Lutheran Nobel Peace Prize winners include Dag Hammerskjöld (Sweden, 1960), Norman Borlaug (USA, 1970), and Leymah Gbowee (Liberia, 2011). Essay: “Nathan Söderblum (1866-1931)” by Dietz Lange, LQ 29 (2015), 33-61. The Nazi Regime gained power through a combination of fervent support and tacit acceptance both in secular society and in churches. Despite statements like the Barmen Declaration, which challenged the Nazification of the church, Christian resistance was internally and externally fragmented. A pastor and professor who resisted fascism, racism and war, Dietrich Bonhoeffer led an underground seminary in the 1930s and worked with German officials who were plotting regime change. He was arrested in 1943 and executed just before the war ended. His witness continues to testify to the power and grace of following Christ and loving our neighbors. Essay: “Dietrich Bonhoeffer (1906-1945) as Confessor” by Richard Bliese, LQ 22 (2008), 40-71. Image: Dietrich Bonhoeffer (1906-1945), with link to The Barmen Declaration. In the aftermath of World War Two, Lutherans around the world came together in efforts to provide relief and help resettle refugees. The Lutheran World Federation (LWF) was born at a meeting in Lund, Sweden. About 90% of the world’s Lutheran church bodies currently affiliate with the LWF. Most member churches support the ordination of women; homosexuality remains an issue on which several church bodies disagree. Major ongoing work of the Lutheran World Federation includes missionary cooperation, education, ecumenical and interreligious dialogue, disaster relief, and human rights advocacy. Essay: “The Episcopal Ministry within the Apostolicity of the Church: A Lutheran Statement” statement of the Lutheran World Federation, LQ 18 (2004), 184-198. The specific move to ordain women to ministry in Denmark began with the question of calling a female minister to serve as chaplain in a women’s prison. Since women had already been admitted into theological studies programs, there were qualified candidates. Though initial requests for ordination were denied, Ruth Vermehren began to serve as a prison chaplain in 1928. Though she started to be paid for her work in 1938, ordination was still denied because of a lack of call from a congregation. In 1947, the law was changed to allow a congregation to extend a call to women, at which time three congregations requested female pastors. Vermehren and two other women were ordained by Bishop Hans Ollgaard on April 28, 1948. Other Lutheran church bodies started ordaining women in the 1960s and 70s. The following essay is a reflection on that history from Bishop Ollgaard himself, from an earlier incarnation of Lutheran Quarterly. Essay: “Women as Clergymen in Denmark” by Hans Ollgaard, Lutheran Quarterly (1949-1977) 18 (1966), 163-167. Through a combination of immigration, mission work, and local evangelizing, Lutheran Churches had been slowly growing in Latin America and the Caribbean during the nineteenth century. Latin American and Caribbean churches were among the founders and early member of the Lutheran World Federation. In 1958, two Argentine seminaries launched together on a project to translate Luther’s works into Spanish, Obras de Martín Lutero. A similar project to translate Luther into Portuguese got its start in Brazil in 1966, with the formation of the Comissão Interluterana de Literatura (Inter-Lutheran Publishing Commission) and its Martinho Lutero: Obras Selecionadas. Translations started to appear in the decades following these first efforts and important translation work remains underway. Essay: “Luther in Spanish” by Nelson Rivera, LQ 30 (2016), 60-67. Essay: “Luther in Portuguese, in Brazil” by Ricardo W. Rieth, LQ 30 (2016), 430-435. Image: Federico Fliedner, author of a 19th century biography of Luther in Spanish, Martín Lutero: Su vida y su obra. Western Colonialism had connected Christianity with European and North American quests for power and harmful racial prejudices. The establishment of independent local churches was an important step in breaking away from such theological and cultural assumptions. In 1959 the Ethiopian Evangelical Church Mekane Jesu brought together seven previous church bodies; with its motto of “serving the whole person,” Mekane Jesu is now the single largest Lutheran church in the world. The second largest Lutheran church in the world today is the Evangelical Lutheran Church in Tanzania, founded in 1963. Churches established in this postcolonial period span the world, from Argentina (1951) to Zimbabwe (1963). Essay: “The Evangelical Lutheran Church in Tanzania, 1963-2013” by Godson S. Maanga, LQ 28 (2014), 179-193. Image: Ebony Nativity Scene by Hilary Marcus of Tanzania, from the Namibia Archives of Wartburg Theological Seminary. Photo by Martin Lohrmann, used with permission. At the 1977 assembly in Dar es Salaam, Tanzania, the Lutheran World Federation declared that resisting the racial politics of apartheid in South Africa and Namibia was a matter of status confessionis, an issue demanding public confession. Member churches around the world then acted on this resolution locally, encouraging churches and individuals to join in anti-apartheid boycotts and support of Namibian independence. The 1984 meeting of the LWF in Budapest enforced this declaration by suspending two white church bodies from South Africa for their part in upholding the apartheid regime. Though apartheid officially ended with Namibian independence in 1990 and a series of democratic elections in South Africa in the early 90s, LWF remains committed to human rights around the world as a core part of Christian faith and witness. Essay: “From Colonialism to Nationalism in Namibia” by Shekutaamba Nambala, LQ 2 (1988), 391-418. Image: Cover of History of the Church in Namibia by Shekutaamba Nambala (Lutheran Quarterly, 1994). In September 1989, weekly Monday night prayers for peace at the St. Nicholas Church in Leipzig became the catalyst for peaceful protests attended by the wider population. Other cities started to hold similar events around East Germany, as well. On October 9, 70,000 people attended the protest in Leipzig, followed by 120,000 participants the next week and 320,000 people after that. East German leader Erich Honecker resigned on October 18 and the Berlin Wall fell on November 9, 1989. While there are many reasons for the fall of communism, the organized protests behind the “Peaceful Revolution” of 1989 started as Monday night prayers for peace at the St. Nicholas Church. The accompanying essay is an open letter by Dr. Tibor Fabiny, Jr. signed by 254 members of the Lutheran Church in Hungary, which describes the challenges facing the church after the demise of the Soviet Bloc. Essay: “The Captivity of our Church Today” by Tibor Fabiny, Jr., LQ 18 (2004), 325-332. 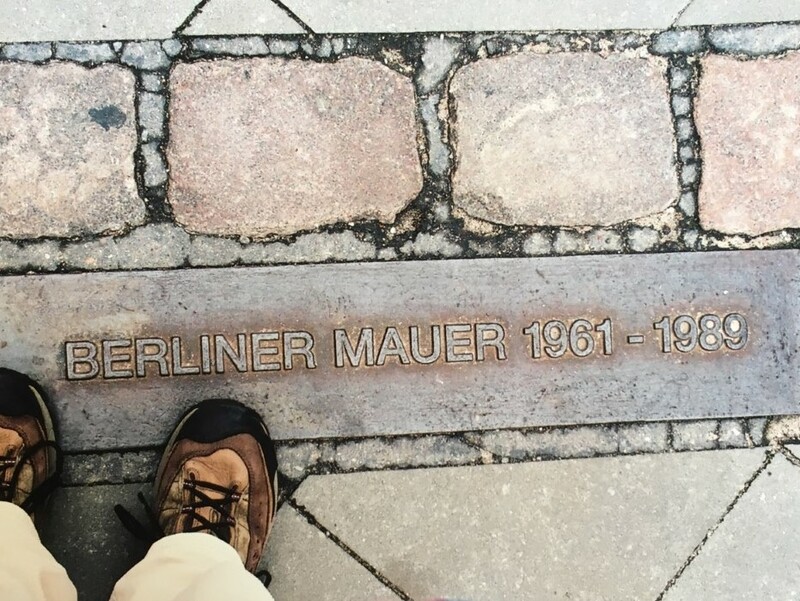 Image: Markers identifying the site of the former Berlin Wall. Photo by Martin Lohrmann, used with permission. In anticipation of the 500th anniversary of the Reformation, Lutheran and Catholic leaders held an ecumenical commemoration service in Lund, Sweden. Worship was led by Pope Francis, LWF President Munib Younan, and LWF General Secretary Martin Junge. Other participants included leaders of the hosting Church of Sweden and the Catholic Diocese of Stockholm. Watch the video of the worship service to experience this monumental spiritual event. Essay: "Commemoration of the Reformation in Germany and Lund" by Theodor Dieter, LQ 31 (2017).